John MacLeod's credentials as a trumpeter/composer/arranger have been firmly established in a distinguished career spanning over thirty years on the Canadian music scene. He has worked with Toronto's most elite musicians and musical organizations in both the jazz and commercial music fields. Although most widely known as a jazz trumpet/flugelhorn soloist, he has also had an active career in the recording studios, theatrical orchestra pits and as a backup musician for dozens of internationally celebrated "name acts". As a jazz artist, he has had the opportunity to perform with many of the music's legends as well as some of the top names in the world today. He has worked with literally every major figure on the Toronto scene and was a featured soloist with one of the world’s most renowned big bands Rob McConnell & the Boss Brass from 1983 until it's demise. He has performed on well over fifty albums and C.D. recordings including Grammy and Juno award winners. He has also acted as a producer/engineer on almost that many again, several of which also garnered Juno awards. At the last National Jazz Awards ceremony held in 2009, John was honoured to be voted "Arranger Of The Year". As a composer and arranger he has scored music for everything from string quartets up to full symphonic orchestra. His big band arrangements can be found in the repertoires of professional and student groups all over Canada, the U.S.A. Europe and Asia. He also frequently works as a guest conductor/clinician/ soloist in Denmark where several groups regularly perform his big band charts. He has been the recipient of arts grants from the Canada Council, the Ontario Arts Council and the Toronto Arts Council to create new works for large jazz ensemble. He has also received numerous commissions to create music for school groups, professional big bands and symphony orchestras. He has created a full program of music associated with Louis Armstrong to feature American trumpeter Marcus Belgrave with symphony orchestra which has been performed in halls across the U.S. and Canada, including the renowned Detroit Symphony. He has also completed several large projects to feature clarinetist Bob Deangelis with symphony orchestra, including "The Coronation Of A King" - a tribute to Benny Goodman which premiered at the Living Arts Center in Mississauga and has been performed by many North American symphony orchestras since. He is the musical director for Bob DeAngelis and the Champagne Symphony which has performed at Roy Thomson Hall in Toronto and Carnegie Hall in New York City. He has also been a guest conductor with the Winnipeg Symphony and the Tucson Symphony orchestras. In 2003, as a vehicle for his arranging and composing, John formed his own large jazz ensemble, the 20 piece group known as John MacLeod and the Rex Hotel Orchestra. They have maintained a feature spot at the Rex Jazz and Blues Bar on the last Monday of every month from 2003 to the present. In October of 2010 the band released it's first CD recording entitled "Our First Set" which in March of 2011 received the Juno award for "Best Traditional Jazz Album". 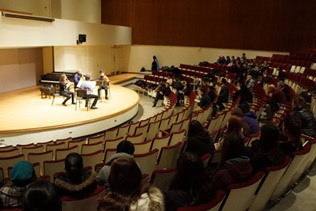 John has been teaching at Humber College in Toronto since 2003 and at the Faculty of Music since 2005.